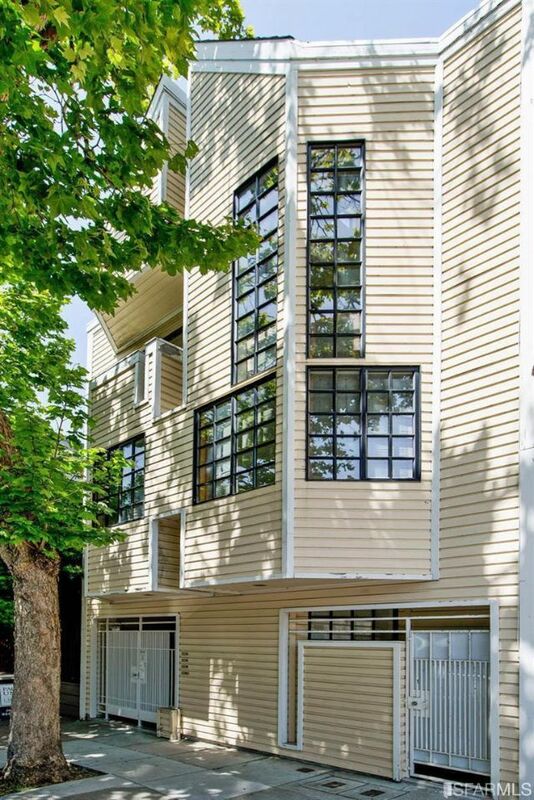 Chic, contemporary, top floor 2 level condo w/a deeded roof deck is located at the rear of a 3 unit building just 1/2 block to Fillmore shops & restaurants. Built in 1987, each of the condos is unique. The striking architecture in this quiet oasis features a living room with 2 story windows, an open floor plan w/a wood burning fireplace seen from the dining room. The kitchen was recently remodeled & features a Italian gas range & hood, dishwasher, disposal & refrigerator. A frosted sliding glass door separates the kitchen from the laundry room. There is an office/den & powder room. Upstairs is a master suite w/ spa like bath & 2nd bedroom w/ ensuite bath. Private deeded roof deck has City views.1 car parking & storage room. Walk score 99!